As I said in the previous post, my life has changed so much just in the span of a couple weeks. We have finished with our training, left the training base where you are only with your commanders and other kids in training (ie – no real soldiers or real units), and have joined the battalion. I’m with the platoon I’ll be with until the end of my service. Our company has a specific role in combat, and my platoon has a specific set of weapons for combat as well. We’re all settled, this is it, we’re full soldiers in the battalion with our job description sealed. It’s as if we’ve finally been “shipped off,” though in Israel that only means being no more than a few hours from home. Veteran (vatik) – 2 years, 4 months into the army. Young (tzair) – Anything less, but of course the youngest are more “tzair” than those drafted later. In an attempt to scare kids into acting the way they want, you hear all the time during training about what the “veterans” are like when you finally reach the battalion. First of all, they’re portrayed as demons. They have nothing better to do than have all the new guys unload shipping crates full of gear, timed with impossible expectations, of course, only to put everything back in the way it was taken out. A whole shipping crate in 2 minutes. The shipping crate is the most notorious form of tzair work (see above picture). Secondly, kitchen duty is far beneath the dignity and respect due to a veteran. They come into the dining hall when the meal is ready, eat, make a mess on purpose, and then leave all the cleaning up to the young ones. But, don’t forget, when you’re young nothing is just at your leisure: you’re on the clock, always. Thirdly, we have to mention what is forbidden. There are many things you aren’t allowed to say, and if you are caught saying them... “oy va voy!” Stupid things. Like, “until when,” “how much is left,” and even any reference to being tired. Oy va voy if you say you’re tired! What else is forbidden? Well, as we were told, anything the veteran wants to claim, he can claim. He can be walking past a group of youngins playing soccer and declare the football “off limits.” Only a veteran is allowed to touch it then. I’ve heard of that happening when the veterans were playing the tzairim. Another great story of this claiming ritual is when a veteran walked past a bedroom of tzairim who were just sitting around, something that is very punishable. The veteran declared everything in the room – all chairs, beds, table, even the floor – off limits. Except one bed. Ten tzairim had to jump onto that bed and stay there until they were released. OK OK OK. So, that’s all the stuff they scared us with while we were at the training base. They said, “If the veteran sees you not working like you’re supposed to, he’ll make you suffer.” I was pretty damn worried about what they were going to do to us after hearing all that for 8 months! Needless to say, when I got to the battalion I had two wide-open eyes, looking for veterans on the prowl. So, two weeks in, was I tortured? Have I called Israeli newspapers looking to expose abuse in the ranks of Golani? No, it’s not so bad. Yeah, we had to unload some crates over and over again, and it was dumb and they were jerks about it. If anything touches the ground... well, you basically have to run with it, and some of the stuff is heavy! So, you learn, and you don’t let anything touch the ground! No big deal, as we say. Kitchen duty – yeah, you’ll do that for a long time. Basically, my group is the youngest in the entire company, so we have to clean all the dishes and trays and all that. But, the November 2007 draft date, guys that fought in Gaza in Operation Cast Lead, guys that have been in for quite a while, they still have to clear up the dining area – clean the floor, empty out trash cans, deal with the extra food, clear tables, and bring us all the dishes. And, worst of all, they are timed too! It takes a long time to get away from being young in the army, so you can deal with it knowing everyone suffered. But overall, I have to say that the veterans are people too. Mainly, they just want to get the hell out of the army. How many times a day do I hear one yell “UNTIL WHEN?! !” Or, “HOW MUCH MORE?! !” To be honest, they’re usually too damn bored or tired to mess with us youngsters. As a matter of fact, I’ve already had a few conversations with a couple of them. They asked me all the typical questions, like why I’m here, how long am I serving for, if I’m dumb or not (why would I join the army if I didn’t have to?). Seriously though, it’s pretty damn weird being around these guys that either fought in Lebanon (the platoon commanders) or Gaza’s Operation Cast Lead (all of them, even my tzair squad commanders). Even though my Dutch friend and I ruthlessly make fun of veterans, simply because they think they’re very cool and very deserving of all honor, I do have some amount of respect for them. Two years and four months in? That’s a long time. That’s nothing to sneeze at. What really gets me is that their training isn’t any easier than mine is at nine months in. They do all the same runs we do, some of which are really tough with combat vests and loaded stretchers. They have all the same gear checks, which are much more serious than you can imagine. They do guard duty and everything, middle of the night and all. After two and a half years of this life, they’re deserving of saying they’re tired. I don’t know. This post isn’t at all what I wanted it to be. I wanted to talk about how strange it feels walking around with my brown Golani beret, but yet feeling so dumb and young. I don’t know anything about anything. I thought that once I’d gotten my beret I’d feel like a real Golanchik. I do feel like a real Golanchik, but now I’m around REAL Golanchikim, and still there’s something different. And yet they’re still veterans who demand respect, and I still feel like an out of place tzair. There’s a post that hasn’t been written yet, but if it ever is, then you’ll get a better feeling for what it means to be an out of place tzair. Sorry for this rambling post, I’m out of practice. does the fact these guys think you are crazy for joining as a volunteer change how you feel about your decision? It sounds kind of like college if you ask me. Graduate as a senior only to become a freshman again, and get hazed. Danny, I cannot describe the amount of respect I (and most likely everyone who reads your blog) have for you man. What an inspiration! I just hope that everything turns out fine for you and you come to terms with the fact that your a hero for being there in the first place (let alone all the dirty work and training that you do). Throughout Jewish history we've been murdered indiscriminately and put through holocausts and pogroms and the like, but for the first time in thousands of years we are actually take up arms, and defend ourselves in our homeland. To be part of that is such an amazing thing. Haha, are they poor shots, or are you just that good? Once you get into combat (if), you'll lose that feeling, perhaps gain a few others. Danny, do they still do Zooboos? Oh, now you've got me really curious. zooboos are always a part of IDF life. I remember being asked teh same question back in my day in 92-95 - "Are you stupid?" I was about 2 years older than the rest. My stock answer was so that "our children won't have to serve." That answer stopped even 18 year-olds in their tracks and left them saying - "what an idiot." I spoke to a former army buddy of mine a couple of years ago. He told me he understands why I did it, almost 15 years later and that I am one of a handful of people in the world he respects. It made my day to know I earned a colleague's respect. He also said he wishes there were many more of us (those who come to serve their people and country). It starts to get easier around the 1 year 4 month mark - keep plugging away and of course KOL HAKAVOD!! I love your blog and take comfort in knowing that there are young people in Israel who are highly motivated when it comes to defending the country. What is the "average soldier's" moral and motivation these days? Are they cynical, burned out or ready to serve? Can I just say - It's so awesome I put that picture up there! You guys don't even REALIZE what that storage container means to my life! Just yesterday we had to take everything out, spread it all out, reorganize it all, put all the stuff in different places on different blankets based on use, etc etc etc - for 2 hours! In the Negev sun! Does the army know you blog as an active soldier? In my day, that was a big no-no. Without intending to, you may be providing the bad guys with info they can turn around and use against us. Word of advice: Check the ego until you are released, and then blog away. Otherwise you may find yourself doing 28 and maybe worse. Anonymous - Oh yeah, that storage container pic is really going to tip off Hizbullah! "Nasrallah, check this out. 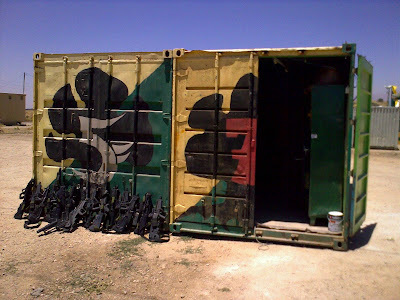 Apparently, the IDF has metal crates to store equipment...AND they paint them!" 1) What ego? You're the egotistical one, leaving a condescending message on a blog that you obviously don't read. Go ahead and try to find even one thing having anything to do with what I do in the army. I haven't talked about battle movements, where we are stationed, what we do on a day to day basis even. In fact, this blog is just one big reservoir of me talking positively and superficially of the army. 2) "In your day" Sod off, old man. That was the point. You dont know enough to talk, much less blog. I was just embarrassed for you, still acting like a tourist and all. And my day was in 2002, so not so long ago. Oh yeah, I was in a much better unit too. Gibush, even to get into Yachsar Golani, must have been a little too tough i guess. Its ok, birthright kids will still pat you on the back, but dont try to kid a kidder, kid. Your quite a jerk. If you don't enjoy reading the blog, you don't have to. Some of us actually enjoy reading Danny's posts. We all really don't care what unit you were in or how tough you are. Just because you were in elite combat unit dosen't give you the right to act condescending towards others. We came here to read about Danny's geeat contribution to the state of Israel, one which he made by choice. Don't listen to this tool Danny, some people can only feel good about themselves by putting others down. Our state is proud to have true soldiers such as yourself. So, do they still do Zooboos? Anonymous Jerk - How about you give me quotes on how I act like a tourist. And not to say something I can't really back up on the Internet, if you met me, you'd take back your words on my ability to do sayeret. I just didn't feel like signing up for 3 years at the age of 24. Let's keep this going. Find me some quotes on how I act like a tourist. Keep in mind that this blog is essentially my training journal, and I made no illusions to it being a war journal. I have about 20 days left before I make Aliyah and head over for my Ulpan. I live in rural VA as well, and coincidentally I'm 24. It was GREAT finding your blog. It's helped me immensely with some of the questions I've had about the training process. I'll be doing a 5 month Ulpan in Kibbutz Mishmar Ha'Emek starting 1 Sept. It would be great to get a correspndence going with you if at all possible. Having someone going through what I plan on getting into would be a great help. Especially an alter-ego. Thanks again for all these great posts. What is it about 24 year old guys from rural Virginia wanting to join the IDF? I am also 24 years old and from rural Virginia (Loudoun County, the non built up western half) and after many delays will be making Aliyah at the beginning of October. I will be spending 5 months at Ulpan Carmel Etzion in Haifa, and then hopefully will be able to go into the Engineering Corps. Reading your blog has been a great inspiration. It is nice to see proof that they will give us older guys a shot at combat units, and we wont we stuck in Jobnick roles. Good luck to you, and stay safe! btw did either one of you guys go through the Aliyah Agency in Maryland? If so did you have Neil as your Shaliach? Yes, I got my Aliyah visa through Neil. Went directly thru JAFI because NBN kept telling me I needed a piece of paperwork that it turns out I didn't need in the end. I know Neil mentioned Danny to me when I met with him. Tim - I guess we don't do Zooboos; I don't know what it is. Maybe we just call it something different. What is it? VA guys - good luck. If you need specific advice about something, send me an email. One of our favorite pastimes back in the day was walkin thru the streets of Hebron (if you can call em 'streets') and calling out "tzair! hey tzair!" and giggling at the indignant heads popping out from behind every bush and rooftop. Ooh would they get mad.